Why is bone marrow collected and examined? The bone marrow produces most of the cellular elements that are found in blood, in particular the white blood cells, red blood cells and platelets. If abnormalities are found in one or more of these components in a patient's blood sample, examination of the bone marrow may help to determine the cause of the problem. What sorts of problems would justify a bone marrow evaluation? The most common reason for wanting to examine the bone marrow is a persistent shortage of one or more of the cellular elements in the blood. Examination of marrow can often provide information about the underlying cause, and may help to predict what the outcome might be. Bone marrow evaluation may also be done to look for certain types of cancer. Some cancers arise in the bone marrow, and others may spread to the bone marrow from elsewhere in the body. 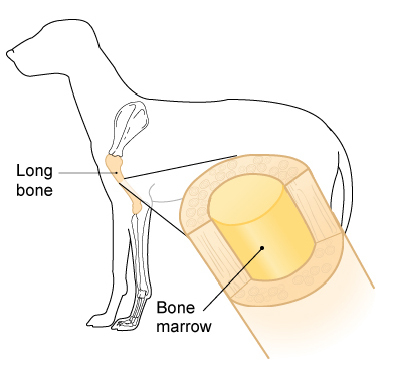 Examination of the bone marrow helps to identify the cancer, and reveals how seriously the marrow is affected. Occasionally, bone marrow is examined to investigate the cause of such things as fever of unknown origin, unexplained weight loss, high blood calcium levels, high serum protein levels, or bone disease. Can marrow be collected from any bone? Although many bones contain marrow, samples are most commonly collected from the hip bone, the top of the thigh bone, and in small animals, the forearm just below the shoulder. "...sedation or light general anesthesia is often used to avoid stress or discomfort to the pet. " The procedure can sometimes be performed just using local anesthesia, but sedation or light general anesthesia is often used to avoid stress or discomfort to the pet. To begin, the skin is prepared surgically, which means it is shaved, cleansed, and disinfected. Then a small nick is made in the skin with a sterile scalpel blade, through which a special bone marrow biopsy needle is firmly pushed through the dense outer layer of the bone into the marrow cavity. A syringe is then attached to the needle, and suction is applied to withdraw a small amount of liquid marrow material into the syringe. This material, called a bone marrow aspirate, is spread on a glass slide, dried, stained with special dyes, and examined under the microscope. Often, a small solid fragment of the bone marrow called a core biopsy is collected at the same time as the marrow aspirate. The core biopsy, which is a tiny cylinder of marrow about ¼" long, is placed in preservative, and after additional processing, is examined under the microscope. What is involved in marrow evaluation? "Marrow evaluation is complex, and the sample is usually sent to a veterinary pathologist for examination." Marrow evaluation is complex, and the sample is usually sent to a veterinary pathologist for examination. The report from the specialist will provide information about how active the marrow is, what cells are present and in what proportion, the presence of abnormal cells, and any other details that may help explain the abnormalities noted in the patient. Does bone marrow evaluation always provide an answer? Examination of the bone marrow can sometimes pinpoint the nature of the problem, and can help to predict how the bone marrow will behave in the near future. This provides the veterinarian with important information that can influence how the pet is treated. 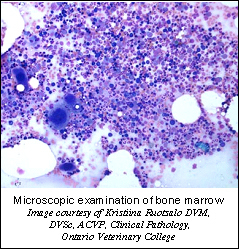 However, in some cases, bone marrow evaluation only confirms that there is a problem, without providing any additional information about the cause.